Another analogue-modelling triumph for Waves, though the EQ section is a little too close to the original for comfort. Very analogue-sounding preamp. Really smooth and silky top end. Big low end. Switchable analogue noise and hum. Same limitations as the original. The Helios mixing desk is a rare classic studio console from the late '60s and '70s with an idiosyncratic upright and sometimes wrap-around design. These custom-built consoles were used by The Rolling Stones for their mobile studio, and The Beatles, who had two in their Apple studios. Waves' HLS Channel gives us a faithful reproduction of the original's features. With the help of renowned engineer/producer Eddie Kramer, Waves sourced a module from the original Rolling Stones mobile console to base it on. The original's character was in no small part due to the varying colouration introduced by harmonic distortion in the preamps, and Waves has precisely modelled this, including an adjustable drive knob and the characteristic noise and hum. On the real thing, the sonic colour imparted would depend on whether you plugged into the line or mic input, and this has been reproduced, with a switch to toggle between the two options. The noise is optional too, and while it's pure nostalgia to hear the hiss increase as you ramp up the gain dial, it's equally satisfying to be able to switch it off when it's not appropriate - noise was always the enemy in the analogue days, after all! The EQ is a faithful reproduction of what was, in its day, a comprehensive three-band equaliser: a 10kHz high-frequency shelf with a +12/-16dB range in 4dB steps (yes, 4dB! ); a mid-range bell curve offering eight choices of centre frequency and a +/-15dB range; and a low-frequency band that's either a variable roll-off at 50Hz or a shelf boost at four frequencies. As a general observation it's fair to say that many software reproductions can be, at times, overly faithful, and this very much applies to HLS Channel. Old gear might well have had a unique sound but it was also frustratingly limiting at times and this EQ is a perfect example, not least the clunky 4dB steps at the top-end. Why not take the best bits of the original while improving on the shortcomings to realise its full potential? The EQ does sound great, though. The top end is extremely smooth and silky and the bottom end particularly fat and warm. The presence range is a little harsh, possibly, but the general mid-range has a highly musical feel and lends itself to mid-scooped 'hi-fi' sonics. The preamp colouration is subtle but it adds to the energy of a sound, making it more urgent - almost as if it's jumping out of the speakers, but not in a compressed way. There can't be that many more classic consoles for software developers to plunder, but the Helios is certainly one that's worth revisiting. 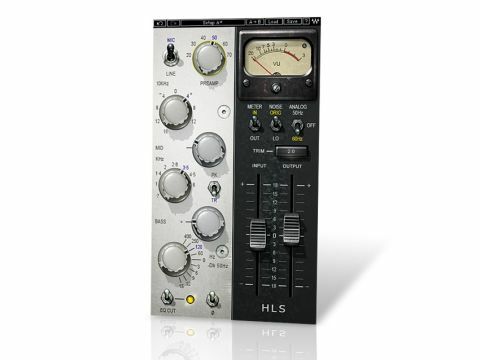 HLS Channel is among the most analogue-sounding plug-ins we've tried, right down to the noise. It also has the limitations of the original, but at least you can add another instance if you need more EQ bands.